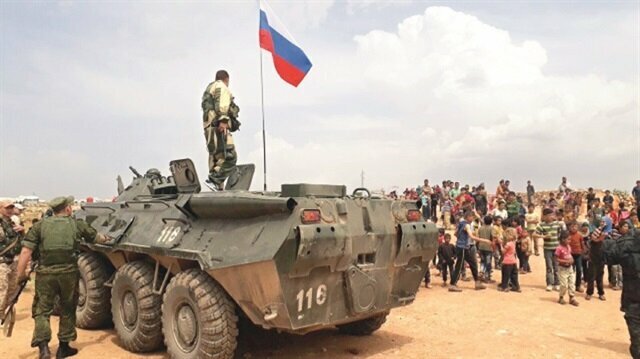 Russian forces positioned in Afrin, where Turkey made extensive preparations to launch a military operation, are leaving the region. It is reported that the Russian army started to quit Afrin and its surrounding villages occupied by PKK/PYD 15 days ago, and withdrew its last troops yesterday with a great change of station. Russia, withdrawing its troops yesterday from Khybar camp in Kafr Jina, positioned in Nubl, a Shi'ite town in Syria. According to sources in the region, nearly 200 Russian soldiers of three special units left Afrin, but from 20 to 50 intelligence officers are kept in the region. These agents operated in the Kitne Village, but they waited ‘ready to withdraw’, said sources. Turkish forces retaliated with artillery fire overnight and destroyed YPG targets after YPG terrorists opened fire on Turkey-backed forces in northern Syria, the Turkish military said on Wednesday.The United States supports the YPG in the fight against Daesh in Syria, despite repeated protests from NATO ally Turkey, which sees classifies the YPG as a terrorist organization.Ankara considers the YPG as an extension of the Kurdistan Workers Party (PKK), which is outlawed in Turkey and is also considered a terrorist group by the United States and the European Union.The Turkish army said that YPG machine-gun fire on Tuesday evening targeted Turkey-backed Free Syrian Army elements in the Maranaz area south of the town of Azaz in northern Syria. "Fire support vehicles in the region were used to retaliate in kind against the harassing fire and the identified targets were destroyed/neutralised," the military statement said.The boom of artillery fire could be heard from the nearby Turkish border town of Kilis, broadcaster Haberturk said.Turkey's Ihlas news agency had reported earlier that the YPG fighters launched intensive gunfire with heavy machine guns around 9:30 pm (1830 GMT) on Tuesday evening from the Afrin region in northwest Syria. It was not clear whether there were any casualties in the exchange of fire.Turkey was angered by a U.S. decision last month to arm the YPG as part of the battle for Daesh's Syrian stronghold of Raqqa. The PKK has carried out an armed insurgency against the Turkish state since 1984 and more than 40,000 people have died in the fighting.Faced with turmoil across its southern border, Turkey last year sent troops into Syria to support Free Syrian Army rebels fighting both Daesh and other terrorist forces who control a large part of Syria's northern border region.Turkish President Recep Tayyip Erdoğan has said that Turkey would not flinch from taking tougher action against the YPG in Syria if Turkey believed it needed to. The Turkish Armed Forces’ operation plans aimed at Afrin have been sped up with the increase in Kurdistan Workers’ Party’s (PKK) harassing against regions rescued from the terrorist organization Daesh within the scope of Euphrates Shield Operation. The recent intense participation of the PKK in the region led Turkey to consider this region as a national security threat. As the military intensity at the border peaks, the preparations at Turkish Armed Forces’ bases in Syria are at their final phase.SEVERE CLASHES EXPECTEDThe Afrin plan, which the Turkish Armed Forces is working on, is being finalized. The operation which is designed to be carried out with the Free Syrian Army (FSA) groups will start from Azaz, Kaljibrin and Mare, and proceed eastwards in the regions occupied by the terrorist organization PKK/PYD. Turkish soldiers and the FSA will primarily seize control of Tell Rifaat and Menagh Military Airbase in the first phase of the operation. Severe clashes are expected around these two targets, located in a quite strategic point in terms of the region. The Menagh Airbase, which is 7 km away from Azaz, and 15 km away from Afrin, was occupied by the PKK in February.US says Assad may be planning chemical attackPKK AND DAESH’S JOINT BLOCKADETell Rifaat, which is amongst the Turkish Armed Forces’ priority targets, may be considered as the door to Afrin. Holding a significant number of opposition, Tell Rifaat was besieged by Daesh and the PKK last year, and opposition members had to surrender the province to the PKK in order to rescue civilians.MERYEMEYN ALSO A TARGETThe Turkish Armed Forces and FSA, which plan to move 7 km eastwards after controlling these areas, also plan to occupy Meryemeyn. No information has been provided yet if the operation forces will enter Afrin or not. It has been indicated that the operation will cease 5 km away from Afrin, and the PKK terrorists in the city may be isolated. Moreover, humanitarian aid convoys will be sent to Afrin for the civilians in the city, following Turkey’s control over the city.THOSE SUPPORTED BY THE CIA ARE EXCLUDEDThere is no precise information on which FSA elements will participate in the Afrin operation with the Turkish Armed Forces. FSA sources stated that some of the groups which participated in the first Euphrates Shield Operation might not be accepted to Afrin Operation due to their organic links to the United States. Some of these groups are supported by the Pentagon or CIA.